Home / Cincinnati Reds / As Time Runs Out…. 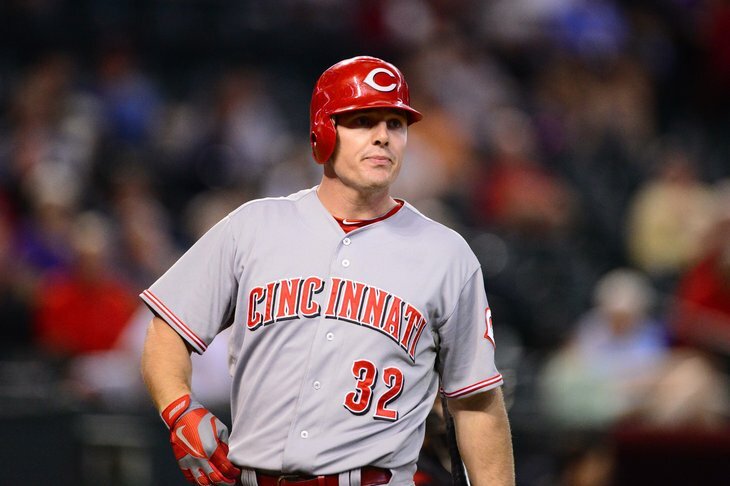 I didn’t see Jay Bruce’s possible last game as a Red on Saturday night. And I would kind of prefer it that way. I didn’t miss much, as Bruce went 0 for 4 and the Reds lost in 10 innings 2-1 in San Diego. But I tuned in today. To see Homer Bailey pitch, and just to see some last glimpses of Jay Bruce in a Reds uniform. I think this will be Jay Bruce’s final day as a Red. It makes me incredibly sad. Jay Bruce has been my favorite Reds player ever. He’s been in my living room every night through the Spring and Summers and into the Fall for the last near decade. So much of my life has changed as he’s grown up in a Reds uniform. In 2005 I remember the day he was drafted. I was living in Cincinnati for the second summer in a row. I was driving on I-275 when they were talking about the Reds second round pick on 700 WLW. Jay Bruce, a kid out of Texas. Then came his meteoric rise through the Minor leagues. I moved back to Columbus to be closer to my fiance. He became the #1 prospect by Baseball America. The excitement was as high as I ever remember for a Reds prospect. The night he made his debut, I owned a condo and lived with my then fiance. I got off work and make the trip up I-71 because I wanted to see the beginning. He knocked three hits all over the ball park and was on base five times. I went back the next evening too; and he got two more hits. Things were still exciting. The Reds were bad, but they were on the climb up the hill. You could feel it. The darkness was soon to come to an end with Bruce at the core. In my own life, I was still young but finally starting to grow up. In 2010 on that September night when he homered off Tim Byrdak and the Reds clinched; fewer sports moments have ever been happier for me. We’ll always have that moment no matter how long time goes on in baseball. There will be many more moments not mentioned here in between that Bruce granted us as fans. All the home runs at Great American. Never a stale moment in the clubhouse. Always a consummate professional. The Reds went to the postseason three times. Bruce played better than any other Red in those games. They came up short. Now sitting here today watching as I finish giving my first kid a bath and waiting on my second to arrive, I see him in uniform in the dugout in the ninth inning in San Diego talking to Joey Votto. There is a feeling of closure. It was two friends talking in the dugout after a decade of playing together. You could almost see them saying ‘man the times, they were good.’ The sense of relief like an era has closed; and Jay Bruce getting traded is definitely the door slamming shut, is there. Jay Bruce and I are no longer just kids growing up. You’ll always remain my favorite Red Jay Bruce. It’s so hard saying goodbye to the players you build a personal attachment to because they’ve been with you through life’s up’s and down’s and their own. I used to find myself believing that someday I would take my son to the ballpark to see Jay Bruce as an aging veteran playing right field for the Reds. It could have easily happened, we just all ran out of time.